Ants receive top billing for the #1 nuisance pest in the United States, according to PestWorld. There are 700+ ant species found in the U.S., however only 25 of these ant species routinely invade structures. By nature, ants are social insects usually building nests underground. Led by a queen, ant colonies consist of a worker caste system. Although ants are attracted to sweet food sources, they will consume most anything that is readily available. Ants have three separate body parts consisting of the head, thorax and pinched abdomen. Ants often invade a structure in search of moisture, food and shelter.Ants are very active in many surrounding cities such as Hemet, San Jacinto, Menifee, Murrieta, Temecula, Winchester, French Valley, Canyon Lake, Perris, Nuevo, Beaumont, Banning, and more. Call 951-652-0505 today. Effective ant control measures begin with a phone call to AmeriGuard Pest Defense for a free ant control quote over the phone. During the initial ant treatment service, our experienced and licensed technician will perform a thorough inspection of your landscape and structure to identify any and all ant trails, both exterior and interior. These exterior trails will be targeted during an ant treatment service with a special product specifically for the unique satellite behavior of argentine ants, called Termidor. AmeriGuard Pest Defense provides lasting ant control by using Termidor, which spreads through the colony like a virus, effectively killing off the ant nests. AmeriGuard Pest Defense is a Termidor Certified Professional company. Only a Termidor certified company can treat your home with Termidor. Termidor may also be used with bait products. The social aspect of the nature of Argentine ants makes them a prime target for Termidor. 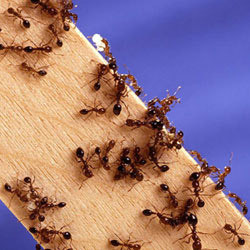 Termidor controls ants through direct and indirect contact. Ants are unable to detect Termidor and ingest and contact it as they continue with their normal activities. The infected ant becomes a carrier of Termidor and thus the “Transfer Effect” begins with ants unknowingly spreading the active ingredient between the colony. Termidor affects the ants between 1-3 days, with control of most ant species occurring within the first week after the initial treatment. Call AmeriGuard today at 951-652-0505 in order to schedule your first service or to ask us any questions you may have. What Can You Do to Get Rid of Ants? Ant control can be further improved with the assistance of our customers. Below are a few tips a homeowner can perform to reduce the likelihood of an ant infestation. Contact your ant service experts at AmeriGuard Pest Defense right now by calling 951-652-0505 for a free ant control quote. Quotes for residential and commercial ant services can be provided over the phone without any obligation. AmeriGuard Pest Defense’s General Pest Control Maintenance Program will eliminate current ants as well as prevent new ant problems. No contracts required! Both the inside and outside of your home are always under warranty with a Maintenance Program. AmeriGuard’s Pest Defense Program guarantees your satisfaction between regular scheduled maintenance with unlimited free re-services for all general pests. If at any time you find yourself in need of an additional treatment between regular scheduled services, call us and we will return to re-treat your home absolutely free! One-Time, Monthly and Bi-Monthly pest control services are available.